BUJUMBURA,March 23rd (ABP) – The pollution of Lake Tanganyika has an impact on the water that is used by more than 80% of people living in Bujumbura City and on biodiversity, according to the Director General of water and sanitation resources, Ir Emmanuel Ndorimana, in an interview he gave to the ABP. The pollution of Lake Tanganyika is a concern, Ndorimana said. Regarding the causes of the pollution, he said that the first cause is rainwater from the mountains (Mumirwa) upstream of Bujumbura City, which consequently takes away all the waste, especially the earth lying in its path, to pour into Lake Tanganyika. About 100,000 tons of land per year flow into the lake, he said, adding that solid waste from households is one of the causes of Lake Tanganyika’s pollution. On this, he meant that the Burundian citizens, especially the townspeople, have the habit of cheating. The waste must be sent to the dumps, but they hide behind the rain and throw the waste into the river channels. He also cited household wastewater that they put them in channels as another cause of lake pollution. Ir Ndorimana pointed out that the wastewater management should be done in the plot by the construction of septic tanks and wells. He further pointed out that wastewater from cheating industries contributes to the pollution of Lake Tanganyika. Normally, he said, an industry must build waste pre-treatment infrastructure before throwing them into the sewage pipes to avoid intoxication of the treatment plant, given that the one available is biologic. The pollution of Lake Tanganyika, according to the Director General of Water and sanitation Resources, leads to the lack of drinking water for the inhabitants of the Bujumbura City. With that, he said the capture, which was previously at 1.8 km is currently 3.5km. 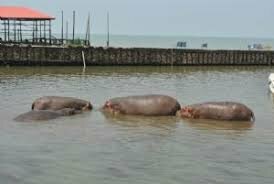 Another consequence is the destruction of biodiversity by the development of water hyacinth that prevents the development of living beings in the lake, as well as the decline in fish production, he continued. Regarding mitigation measures, Ir Ndorimana recommends that the townspeople should not dispose of solid and liquid waste in rainwater pipes and rivers. He also recommends not building in the 25 meters provided by Article 5 of the Water Code, but rather to plant trees in this area. He also wanted everyone to be responsible for waste management because, he believes, sanitation is dignity. He ended his remarks by recommending to the administration to be responsible in the management of the waste in its locality because, he specifies, the lake is our life and our wealth, we must protect it.